Materials needed: one worksheet for each pair. 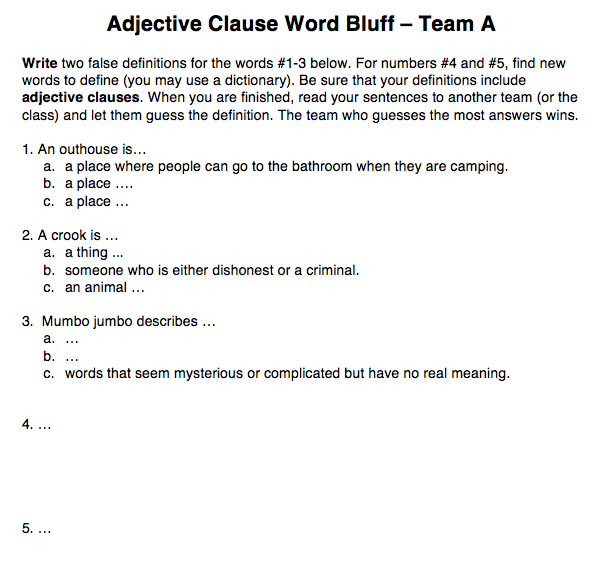 Word Bluff is a game that can be easily adapted to practice adjective clauses/relative clauses. In the game, students work in pairs to write definitions of challenging English words. Students write three definitions for each word, with only one definition being the correct definition (the correct definition is included for the first three words on the worksheet). Afterwards, students read the definitions to another pair (or the class), who then have to guess which definition is the real one. This activity should be done to practice writing defining adjective clauses. Similar instructions can be read below in the worksheet preview. The worksheet has a second page for the second pair which is not shown here. You can download the worksheet through the link above. I hope you find this game fun. In my experience, students enjoy it. It can be a good controlled activity for practicing adjective clauses.